Over the past month, E2, a national, nonpartisan business group and partner of the National Resource Defense Council (NRDC), published three jobs reports: Clean Jobs America, Clean Jobs Colorado and Clean Jobs Pennsylvania. Clean Jobs America reported that nearly 3.2 million Americans work in clean energy—in energy efficiency, renewable energy, clean vehicles, and other smaller sectors like energy storage and grid modernization. 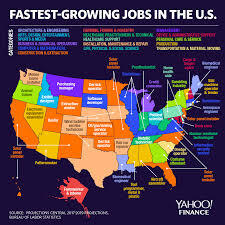 Wind power supports over 105,000 jobs nation-wide, with jobs in all 50 states. Many of these bring new opportunities to farming and factory towns, since more than 500 U.S. factories build wind-related parts. Continue reading here. WASHINGTON, D.C. – According to new research released today by the Solar Energy Industries Association, more than 46 megawatts (MW) of solar capacity are operating at 37 professional sports facilities nationwide. In the last five years alone, professional teams and facilities have installed nearly 34 MW of capacity across 16 installations, representing almost 75 percent of all the solar capacity currently in operation at sports arenas. Every leading sports league in the United States, including the NFL, NBA, MLB, NHL, MLS, NASCAR and IndyCar boast solar assets. A third of the NFL stadiums in the U.S. have a solar system, with the MLB and NBA not far behind with 30 percent each. To put the proliferation of solar across professional sports in context, last year nearly 42 million Americans attended an event at a stadium, arena or raceway with a solar system. This entry was posted in NewsBlog, Research and tagged American Wind Energy Association (AWEA), Bureau of Labor Statistics, Clean Jobs America, clean vehicles, E2, energy efficiency jobs, energy storage jobs, fastest growing occupations in the U.S., grid modernization jobs, Solar Energy Industries Association, solar-powered U.S. sports facilities, wind and solar energy jobs on June 27, 2018 by Helen Deffenbacher. Of the 10 states where solar jobs grew fastest between 2015 and 2016, eight voted for Mr. Trump in the 2016 election, according to figures from the Solar Foundation, which tracks the industry. 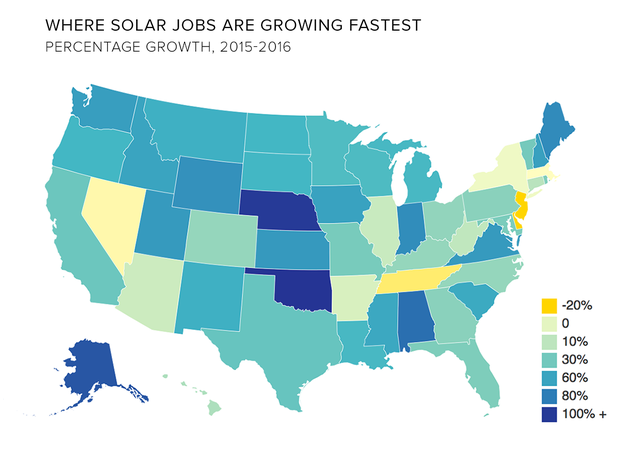 In the three top states — Oklahoma, Nebraska and Alaska — the number of people working in solar grew by 100 percent from 2015 to 2016. “Solar has become a clean, inexpensive source of electricity. Especially on the utilities side, it’s competitive with gas and coal,” said Colin Smith, a solar analyst at GTM Research. This entry was posted in Nebraska / Midwest News, NewsBlog and tagged Bureau of Labor Statistics, Greentech Media Research, Nebraskans for Solar, Occupational Outlook Handbook: Solar Photovoltaic Installers, solar jobs in Nebraska, The Solar Foundtation on October 27, 2017 by Helen Deffenbacher.